Hello, interwebz! 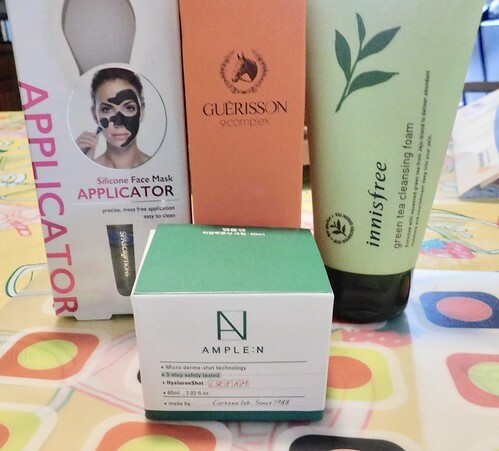 Today, I’m going over a few products from a few different places. 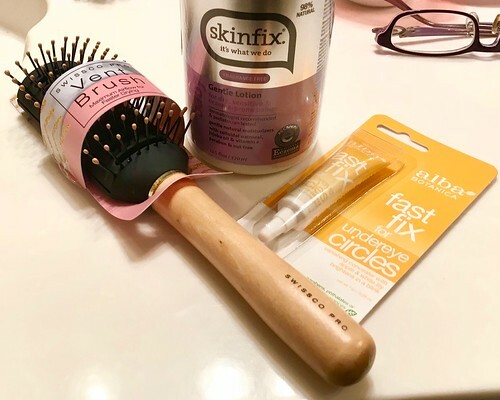 I got these products in May and have had plenty of time review and test most of it. First up, was my trip to Marshall’s. As I said in a previous post, I got a crappy brush for my hair the last time I went to Marshall’s. So, I tried a new one. The Swissco Pro Vent Brush works very well on my hair. I only brush my hair before I wash it (2-3 times per week) and have no idea how it works as an actual vent brush since I don’t blow dry my hair. It does remove tangles easily, pulls stray hairs from my head, and massages my scalp as I brush. 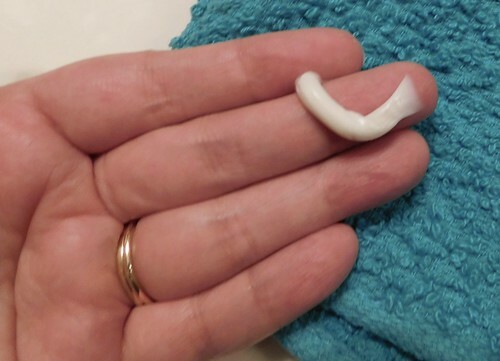 The Skinfix Gentle Lotion was intended for babies with eczema. (That’s me!) In all seriousness, I absolutely love this lotion! It soothed my skin right away. My back is slowly improving from using this. 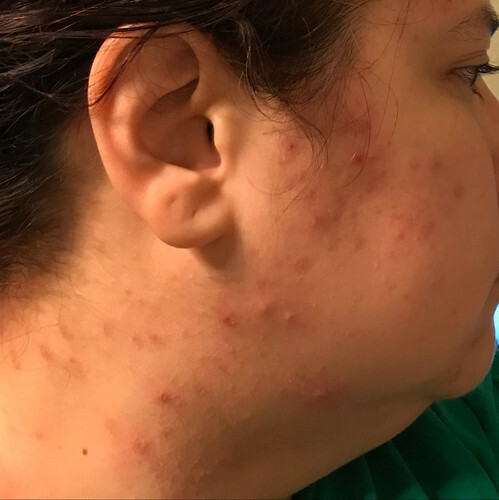 I tried using it on my face, but it healed eczema while creating pimples. So, that was a bit disappointing. This lotion has helped me stop scratching my back in my sleep, and for that I am grateful. I bought the Alba Fast Fix for Undereye Circles after using their fast fix tinted moisturizer spot treatment. This did work well as a concealer, but didn’t last all day. However, it didn’t bother my skin. So, I still like it. If you have sensitive skin and are looking for a concealer, try this one. I loved the bag because I love all things travel. The eyeshadow and lip créme match and are both colors that I use, but I didn’t try the eyeshadow yet. The lip créme was soft, but I didn’t see much of a change to the color of my lips. I have never been able to put on my own eyeliner, but I tried the Eyeko eyeliner a few times before washing my face at night and really liked how smoothly it went on, even over the dry patches on my right eye. I can’t speak to it’s staying power since I immediately washed it off my face. The mud mask is great! 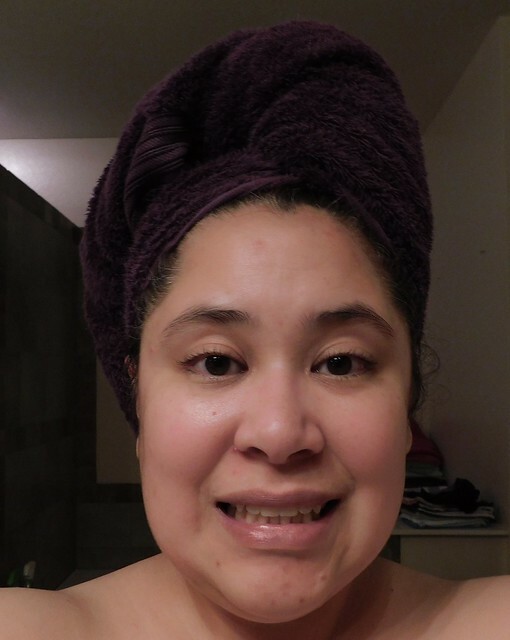 I loved how clean my face felt afterwards without feeling too dry. I will say that any open sores on my face stung a bit, but that was to be expected. 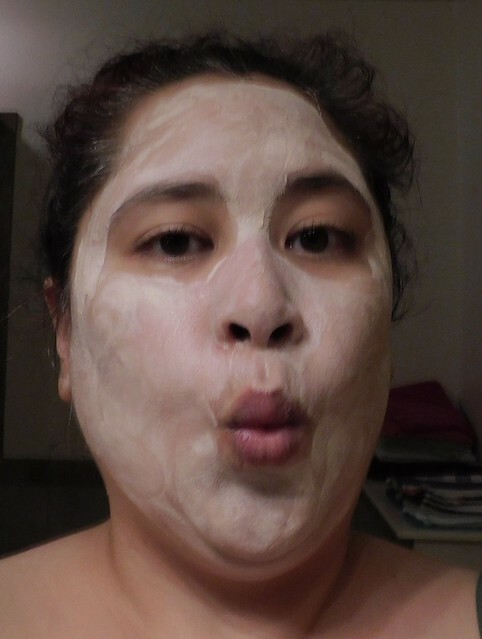 Otherwise, it felt like the mask did a decent job at both cleaning and shrinking my pores. 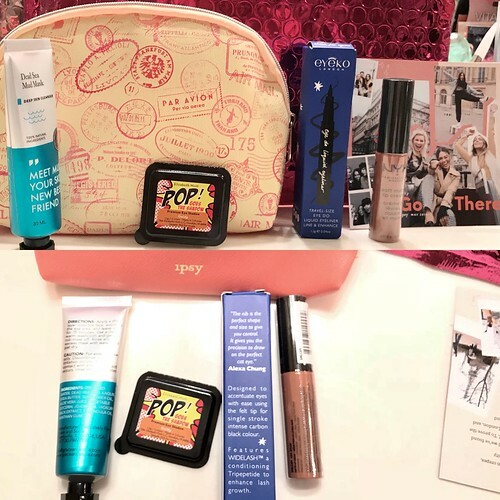 If you’d like to try Ipsy, you can use my referral link. I get 250 points, but I’m not sure what you get. Maybe a discount? I wish the site were clearer on that. Now, the part I have been waiting for *drumroll please*. 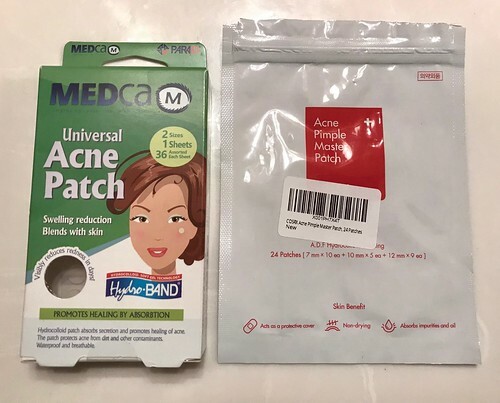 Medca M Universal Acne Patches vs CosRX Acne Pimple Master Patch. 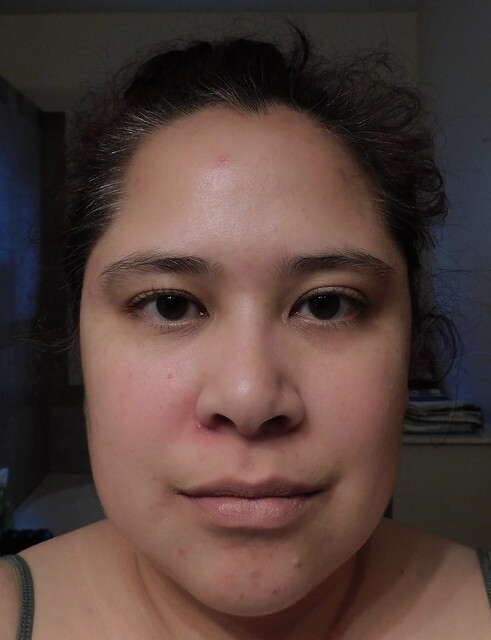 I tried CosRX first and was pleasantly surprised at how well they stuck to my face and how much junk they pulled from my pores. 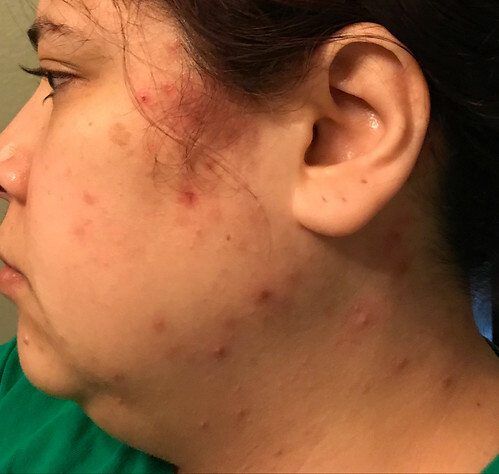 I tried the Medca patches because they were a bit cheaper and I knew I’d be going through lots of acne patches. The Medca patches were nowhere near as sticky as the CosRX patches were. If you got them to stay in place, then they would pull a decent amount of gunk from your pores. However, you couldn’t touch any part of the patch without losing both the stickiness and the effectiveness of the gunk pulling. 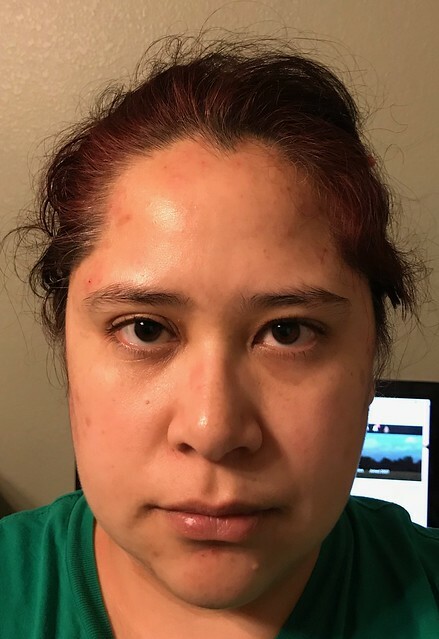 Since you apply the patches with your hands, I couldn’t figure out a way to guarantee that the Medca patches didn’t fall off my face before I even made it to bed. I am now on my third package of CosRX patches and am leery about trying any other brands for fear of disappointment. 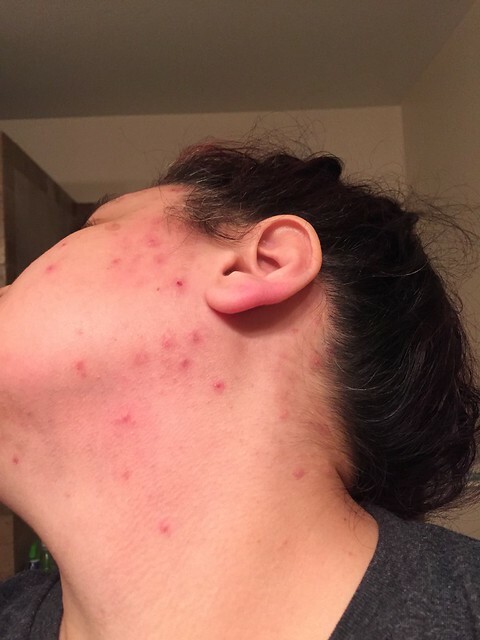 Those are a few things that have been helping my eczema, acne, and desire to try new things. Have you ever tried Ipsy? What was your experience like? 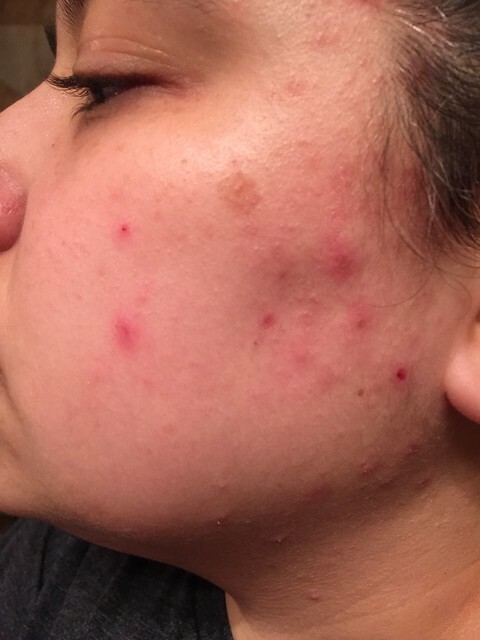 Do you recommend any other brands of pimple patches? Let me know in the comments what kind of shopping and skin experiences you’ve been having! Thanks for reading! Hello, interwebz! I guess the title of this post is kinda a misnomer. I only did one of these in June, but I didn’t want to do a bunch of mini-posts, so they’re all getting stuck in June this time. I was really getting into watercolor for awhile, but I switched to working days and joked with a coworker that I would do a tiny painting for him. 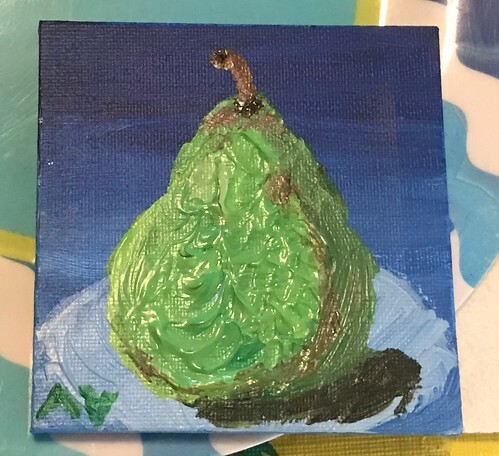 He randomly told me to paint a pear. So, I did. I bought a tiny canvas at WalMart, and busted out my cheap Royal Langnickel acrylics and a set of random Royal Langnickel brushes that I got from Joann. The plate was $1 at Party City years ago and the plastic is peeling off of it. 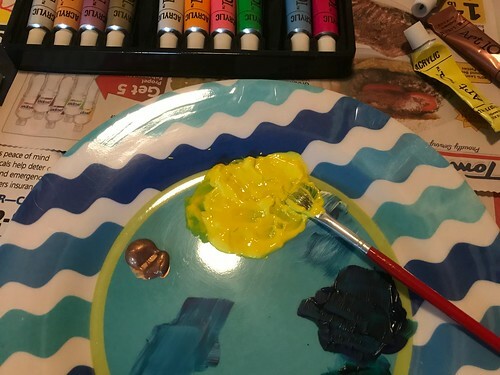 So, it’s not good for feeding my children, but it’s great for mixing paint colors! I had to throw away quite a few brushes. They lost hairs easily and were clumped up with paint instead of holding the paint well. However, there were some good ones that I kept. I separated them from the brushes I liked from the ones that I hadn’t tried yet so I wouldn’t confuse them. The paint was surprisingly good since it was less than $1 per tube. This wasn’t the fastest drying paint in the world, but it was also a hot and humid day and I was layering the paint on pretty thick. When I finished, I let everything dry and the paint ended up peeling right off the plate. The brushes were cleaned and left to dry on paper towels and I still had plenty of paint for my next project. I was actually impressed with my work! I wanted to paint some more! Then, Erica and I started joking about bananas at work and we agreed to do banana paintings for each other. She made the cutest pour art banana for me and I was completely uninspired to do one for her. Why aren’t bananas as exciting as pears? Should I do a cute banana or a real banana? Should I do a single banana or a bunch of bananas? I was overthinking it, so I stopped thinking. 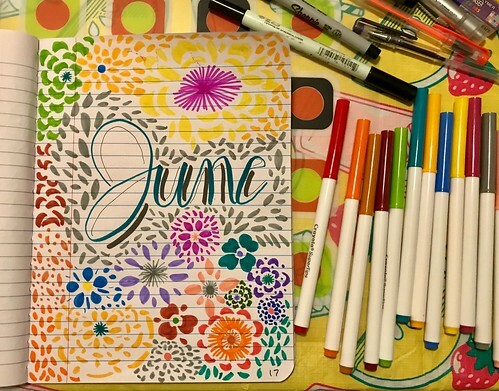 Towards the end of May, I got the urge to decorate a June page in the bullet journal that I keep for my blog. I kept a pretty box of nose tissue around because it was so pretty and I thought I might use the box in some planning decoration, but I ended up using it as inspiration for the June bullet journal page. It wasn’t paint, but I did love playing with shapes and colors that I don’t use often. The Crayola SuperTips were fun to use in writing and art. After that, I decided that I was ready for the banana. 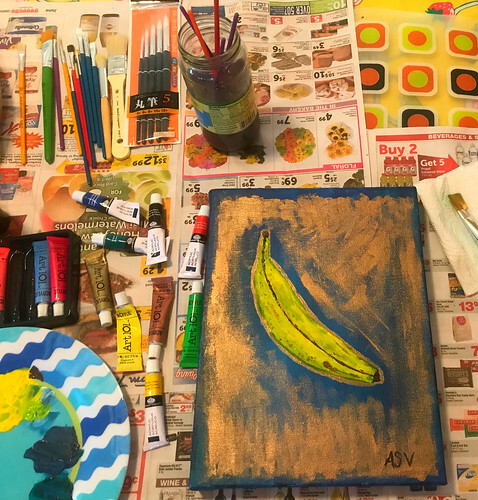 I looked through a few hundred banana paintings online before I found two that I wanted to emulate. I wanted to use my neon paints and do kinda like a 90s flashback banana painting. So, I gathered my supplies. I got a set of two Premio stretched canvases at Tuesday Morning for about $8. I also picked up some Basic yellow paint at Tuesday Morning, but decided it wouldn’t be neon enough for this flashback art. I brought out my Daiso brushes, but ended up not using any of them and sticking with the Royal Langnickel brushes that I used before. 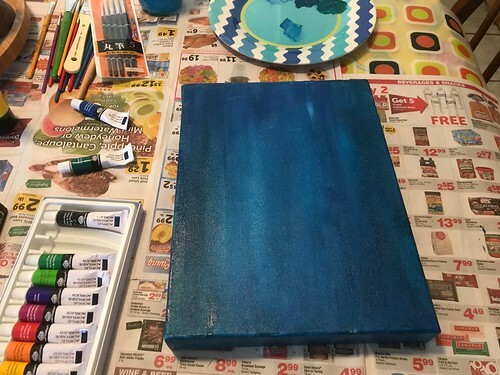 I brought out my Royal Langnickel paint, but thought I might use the Art 101 paint from Five Below for the whole painting. My Royal Langnickel blue ended up being much darker than expected. I had to put down five layers of neon yellow to get the banana to not look completely green. The Art 101 paint was trash, though. 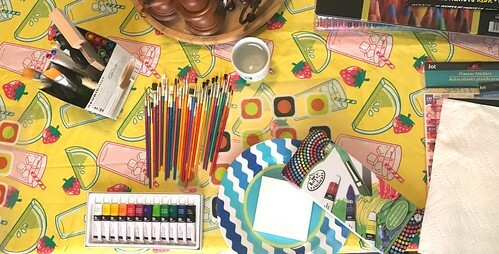 The set came with six metallic colors and six neon colors. The paint came out lumpy and runny, was difficult to mix, and was difficult to move on the canvas. Because the blue came out so much darker than I had anticipated, I decided to try to brighten it up with some metallic copper paint. That paint was pretty sheer, but not quite as lumpy. I was pleased with the effect for this painting. So, I think it was just the neon paint that wasn’t quite as rich and pigmented as I wanted it. The paints were cheap, so I’m okay with it. I just know now that I should spend a few more dollars and get some pretty decent paint that isn’t Art 101 brand. So, that’s all the painting for now. 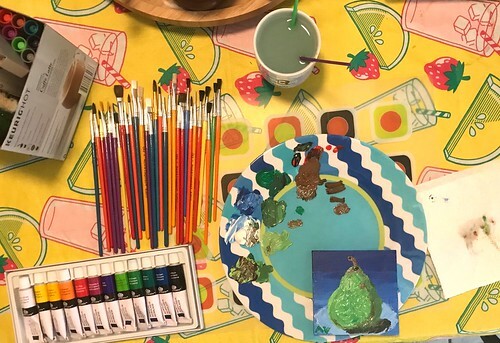 I kinda want to make a fruit painting for all the important people in my life…whether they want a fruit painting or not! So, I’ll keep ya posted on how many people I get to hate art and fruit at the same time! 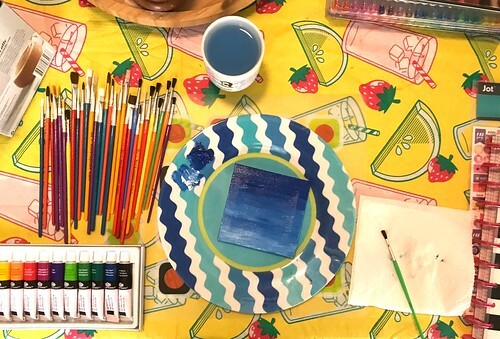 Do you ever paint? What kinds of paints do you prefer? 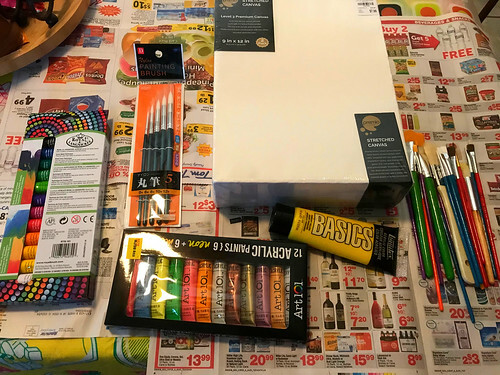 Do you plan out your paintings before you get supplies? Tell me your art stories in the comments! Hello, Interwebz! As I type this, I am listening to The Indicator episode about delayed gratification and am trying to figure out if I will be successful in life. I used to tear into these Love With Food boxes immediately, but now that I write about them, I wait for weeks to open them. If you’ve ever wanted to try the snack box that also donates meals to food banks, then now is a great time. The semi-annual snack sale is going on through June 30, 2018! This month’s theme is Thrive. It’s a reminder to “not just live, but thrive!” The box flyer also reminds us to be thankful to the people who help us thrive. (TRUWOMEN) You’re Mocha Me Cocoa Protein Powder – Haven’t tried this yet, but you mix it with water for a chocolately protein drink. (You Love Fruit) Fruit Leather – Yummy, but hard to eat. They are multiple thin slices of fruit (mine was mango) that you peel off a piece of paper and eat separately. They were so thin that I couldn’t really chew them and they stuck to my teeth. Delicious, though! (Stoneridge Orchards) Montmorency Cherries – These cherries are huge! They are dried and taste like cherries instead of sugar, so that’s good. I like them alone, in a homemade mixture of dried fruit and almonds, or added to my yogurt. They would probably be good added in anything and everything. Chocolate chip cherry cookies, anyone? 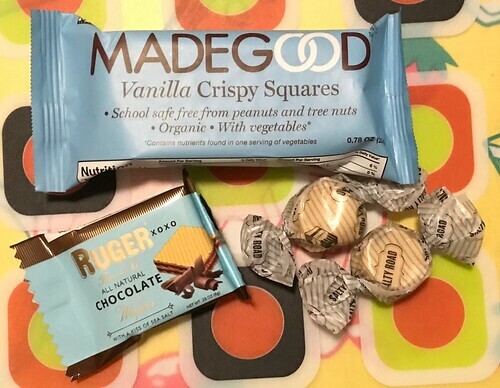 (MadeGood) Vanilla Crispy Square – I was most surprised by this item. It is a big puffed rice cereal square with no gelatin/marshmallow in sight. Seeing as I looooove marshmallows, but I do not eat gelatin, these are absolute heaven for me! Not as sweet as a typical puffed rice treat either. (Salty Road) Passion Fruit Salt Water Taffy – Haven’t tried this yet, but I have had this company’s other taffy flavors in other boxes and they were soft and tasty! 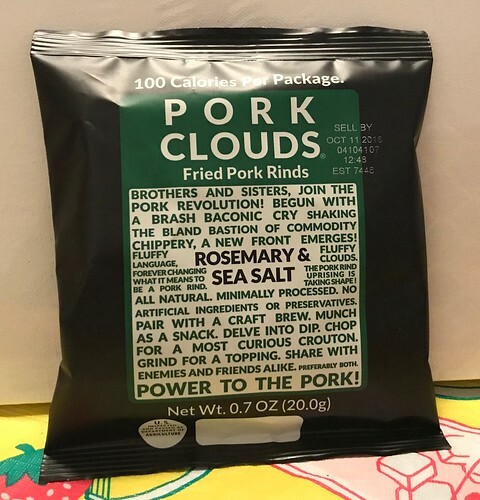 (Bacon’s Heir) Pork Clouds – I’m vegetarian and did not eat these. I’ve had them in boxes before and gave them to my husband, who though they were good and interesting. This time, I gave them to a coworker who has yet to eat them. So, that’s it for my May snacking box. Maybe I’ll be extra motivated and review my June snacking box in June! As mentioned earlier, the Semi-Annual Snack Sale is going on right now at Love With Food. If you use code “SASS18” when you buy a plan for at least six months, you can get $10 off and a free box worth $20! Let me know if you do try Love With Food and what you think about the subscription boxes. 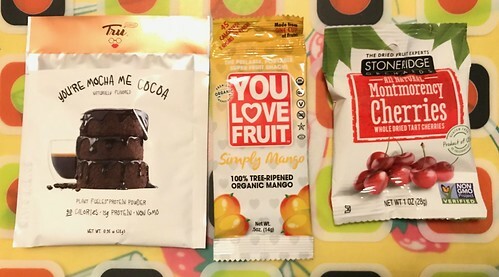 Let me know what you think of any of the snacks you buy on the site too. Do you subscribe to any other subscription snack boxes? Would you recommend them? If you love free stuff, make sure not to miss any of my upcoming blogs. I will be announcing a giveaway soon from another company that I love. In the meantime, thanks for reading! Hello, interwebz! In the last part of my skincare saga, I began a skincare routine to deal with severe acne, pimples, irritation, eczema. 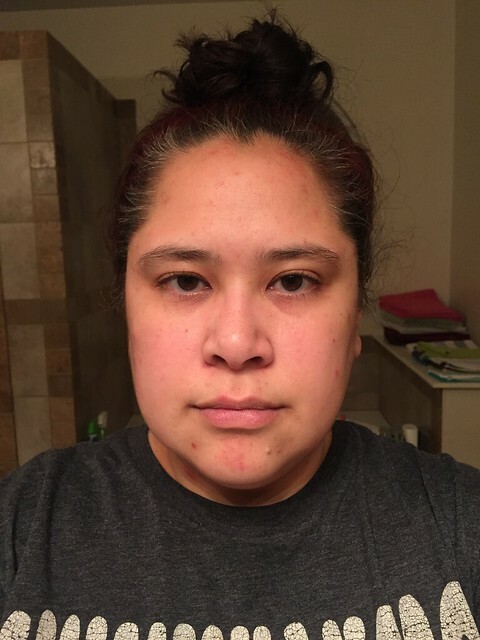 After about four days, I switched out products to an even more gentle routine. This was when I tried the horse oil toner that worked so well. 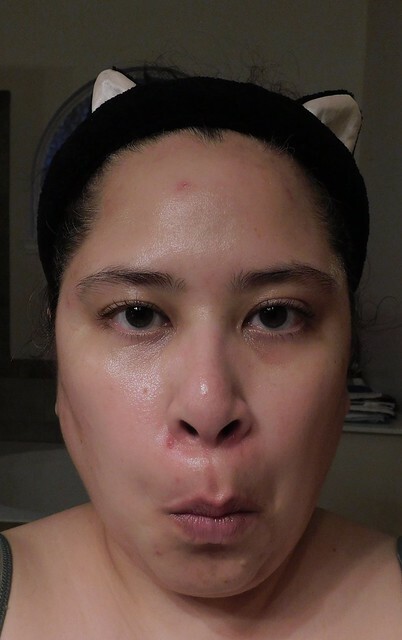 I also used CosRX Acne Pimple Master Patches, which is what really started making a difference on my cystic acne around my nose and chin. Afterwards, I realized that my problem was less of a pimple issue and more of an irritation issue. I went to the Shiseido store and picked up some cotton squares that don’t fall apart the way the dollar brands do. They didn’t have anything to treat acne or eczema, but I got some samples of products to help with moisture and color spots. I also got an Esfolio Banana Mask to see if it would help. It was amazing! 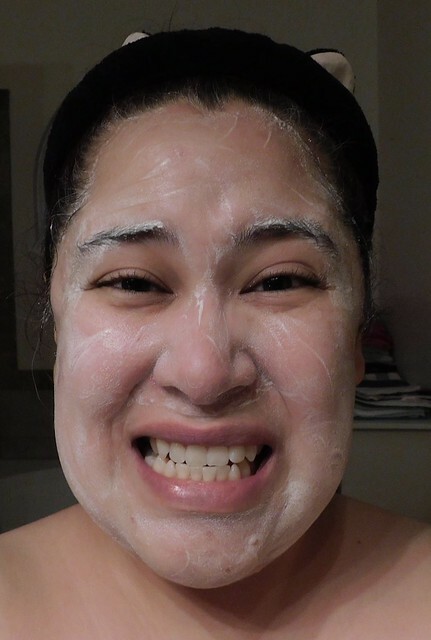 The mask immediately calmed my skin and took away the redness from anything that wasn’t a scab or sore. It smelled like a banana milkshake and the fragrance didn’t bother my skin or nose. 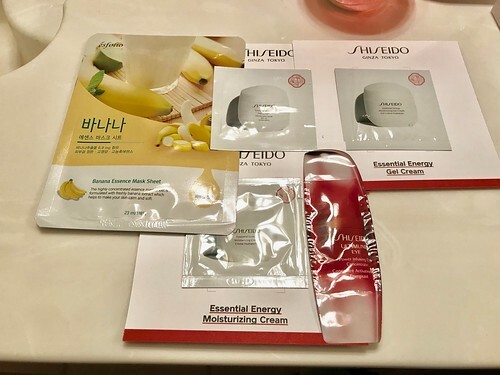 Shiseido sunscreen has also been the only sunscreen that I’ve tried so far that hasn’t caused breakouts, has no scent, and withstood my constant sweating in this Texas heat. I used a sample, but will be buying a full size container soon. Near Shiseido was another Asian beauty store that sold a brand I had never heard of before – a.c. care. I was told that this is what all the teenagers with acne buy because it’s on sale often, whereas Dr. Jart never goes on sale at that store. a.c. care products are supposed to be made with bee venom and other natural ingredients. 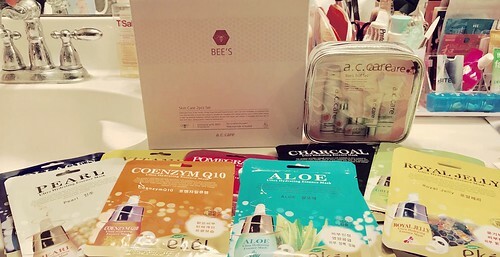 Buying the treatment set meant that I also got the face cleanser, trial kit, and samples for free. Along with the “buy 10, get 7” masks deal, I believe everything came to a little less than $94. I had never spent that much money on beauty products in my life! I have always tried to stick to the $5 and under range, but I was desperate. Ben ended up buying it all for me as my Mother’s Day gift and we joked about me getting a new face for Mother’s Day. Now, you may be thinking, “Hey idiot! How is bee venom any better than horse oil? !” It’s not. When the sales woman said, “bee venom”, I thought, “bee spit”. It might be a little gross, but that’s basically honey, and I knew that honey was good for my skin. Stupidity is no excuse, though. When I read the ingredients lists, most of the products had bee’s venom at the end of the ingredients list. That made me feel better because we were basically paying for the words on the box and not the actual venom. However, I did decide to write up the first five ingredients in every product and link them to reports on how good or bad the ingredients are (see the end of my post). Some of the links provided are easier to read and understand than the actual research papers I read on them. Most of the ingredients actually weren’t very natural and has questionable side effects. I didn’t want horse meat on my face, but I was willing to try butylene flycol and denatured alcohol to see if they might give me some relief. After three weeks of using this stuff, I do think it’s helping. 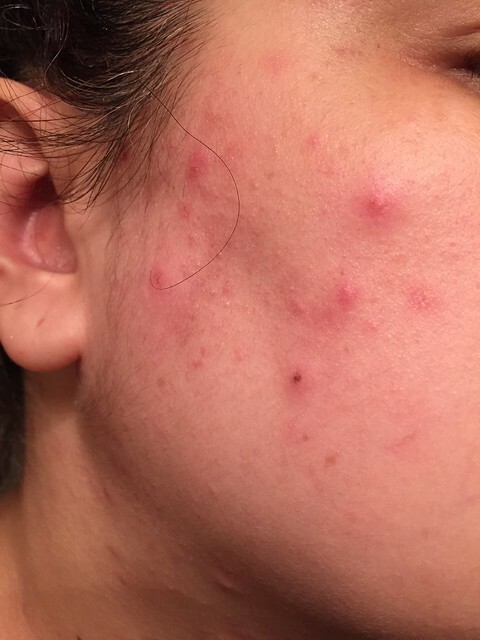 Pimples aren’t really an issue anymore, just the inflammation, texture, and sores. 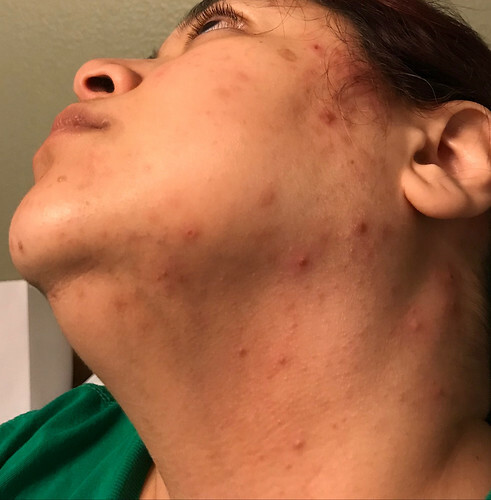 The eczema is all over my neck, chest, and back too. I even have spots of it on my fingers. So, I think the heat is aggravating my eczema all over. 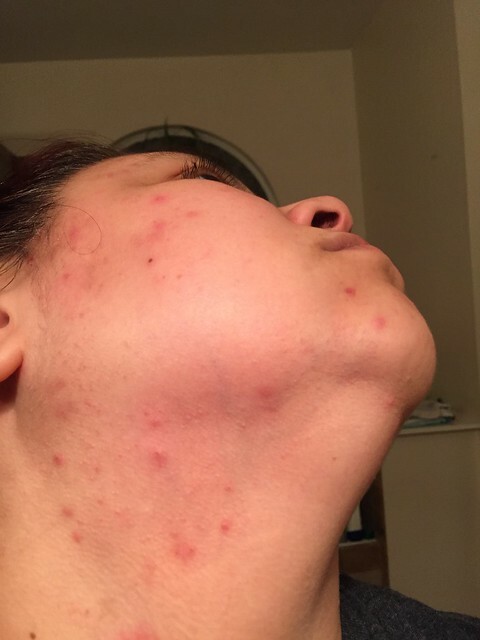 I have seen improvements on my face and neck in terms of calming new irritations. 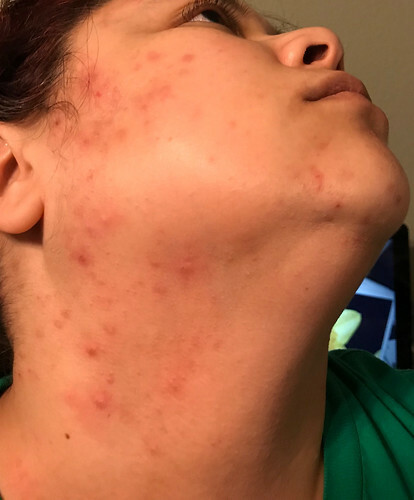 I have no new cystic acne and have slow improvement on parts of the eczema. I have a bad habit of picking at my skin during the day and don’t even realize what I’m doing until my hands are bloody. So, that is not helping. Mostly, I am trying to be consistent and patient. Surprisingly enough, my new skincare routine seems to be working. Hello, interwebz! I’ve been a bit delayed in planning. Summer weather is in full swing in Texas, so I wake up with a 50/50 chance of being able to get out of bed each day. Luckily, I was able to get some planning done this week! 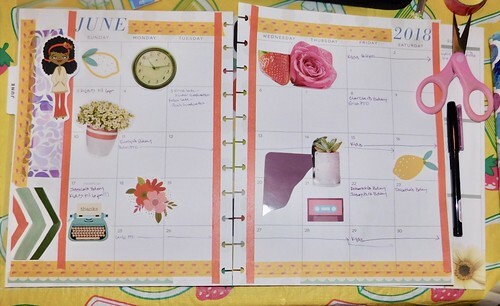 I prepared my calendars for the month of June as well as the current week. 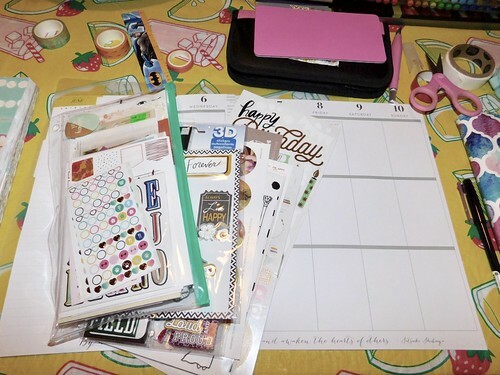 I gathered all of my materials, including a new Playful Icons scrapbook paper bundle that I got at Tuesday Morning for $2.99! I didn’t really have any specific theme in mind because my brain was a bit fried from the heat. 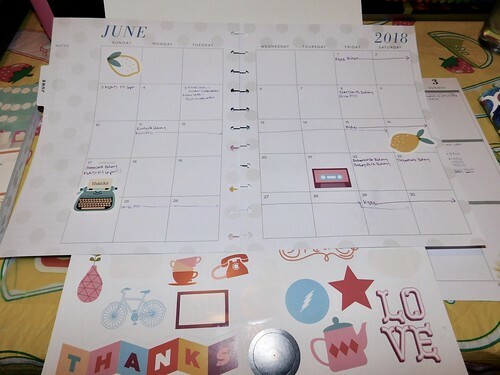 The paper bundle came with some stickers, and I found a few that went well with June/summer. There was already a lot written on the pages, so I just worked around it. Then, I found some trim in the paper bundle that I wanted to use as borders. I used my handy craft knife to slice up the paper. I cut over the calendar paper without thinking and accidentally cut the calendar pages. Luckily, the pages are thick, so I didn’t slice all the way through the calendar pages. Lesson learned. 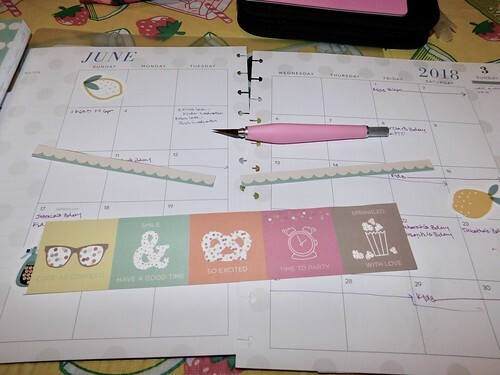 Since I hadn’t used my flamingo washi yet, I decided that it would be the perfect addition to this month. 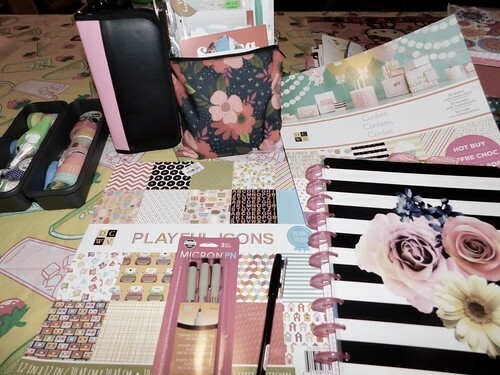 I followed that up with die cuts and some magazine clippings from my collection. 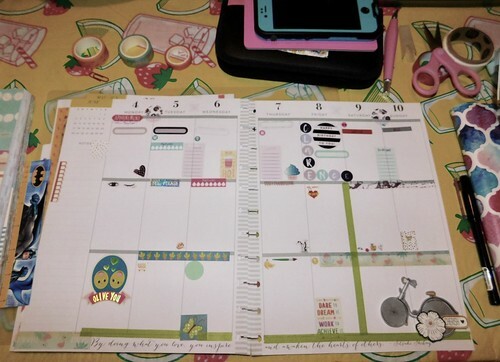 Moving on to my weekly calendar, I knew that I wanted to mostly use stickers. One of my good work friends has a birthday this week, so I spelled his name out in stickers. I left a lot of space and notes stickers to record info on work, health, events, etc. I plopped on some cute stickers with positive messages and was done. I’m looking for daily reminders that, despite my health problems, life is still good! So, what did you think of these flamingo spreads? Do you prefer using stickers or die cuts and Glue Dots? Let me know if you have any suggestions on surviving triple digit summers in Texas!